You may not know about Revista, the magazine about Latin America produced by the David Rockefeller Center for Latin American Studies here at Harvard. It covers a range of issues relating to the region, from architecture to violence to dance. What’s remarkable about this group (if I may brag about our Nieman Fellows for a bit) is that so many of them are proving to be among the region’s most important journalism innovators, starting their own news outlets in what has sometimes been criticized as a conservative media culture: Penaranda with Página Siete, Mochofsky with el puercoespín, and León with La Silla Vacía. Give the issue a read. Benton, Joshua. 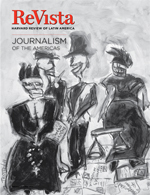 "A great resource on new Latin American journalism." Nieman Journalism Lab. Nieman Foundation for Journalism at Harvard, 25 Apr. 2011. Web. 18 Apr. 2019. Benton, Joshua. "A great resource on new Latin American journalism." Nieman Journalism Lab. Last modified April 25, 2011. Accessed April 18, 2019. https://www.niemanlab.org/2011/04/a-great-resource-on-new-latin-american-journalism/.